Ayibaebi O. Fyneface, popularly known as Ebi is a Public Administrator from the University of Abuja, she is a gospel artiste, songwriter, author of lots of books, CEO of AYIS Beauty Touch Salon and Fyne Makeup Studio, founder of DZion Sisters Fellowship & Mount Olives Fellowship International. An anointed minister of the gospel, born and raised in Port Harcourt Nigeria, married with two kids, She started singing at age 17, but came into music professionally in 2003. She is musically influenced by the like of Cece Winans, Whitney Houston, Micah Stampley, Byron Cage, Donnie Mcclurkin, Panam Percy Paul, and many more. After the release of her previous single "Higher", Ebi decides to blow us away with her new single titled "Chimobi-Moo" meaning “The God That Holds & Knows My Heart”. 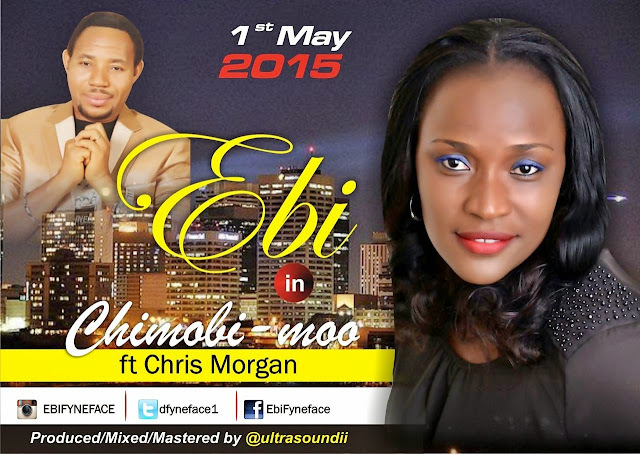 Featuring renowned gospel artiste, Chris Morgan, this track was born out of the experiences Ebi has been through, She still acknowledges the hand of God and His unending love. “He's never forsaken me and has been there all the way. He will come through for me because He promised never to leave nor forsake me! Chimobi-Moo.... The God of my being and existence” - Ebi. Produced, mixed and mastered by UltraSound. She is the initiator of DLords Mobile Orphanage where she works with some low orphanage homes in Abuja, making sure these homes are given proper attention. Recently, Ebi was given an award by AFYSDI (AFRICAN WOMAN HALL OF FAME) in recognition of her professional competence in promoting girl-child education and empowerment in Nigeria. To God be the glory. Ebi has shared the same platform with artistes like Panam Percy Paul, Asu Ekiye, Samsong, Sammie Okposo, Kefee, Chris Morgan, Solomon Lange, Jeremiah Gyang and many more. She has two musical albums and music videos to her credit, currently working on the 3rd album. She enjoys swimming, singing, reading and writing. Ebi Fyneface is the treasurer of FOGMMON. (Fellowship of Gospel Music MInisters of Nigeria).